Buy your tickets for the Montjuïc Cable Car quickly and easily now. Visit Barcelona from on high and enjoy spectacular views of the city from inside the Cable Car. Arrive in style and with ease at the wonderful Montjuïc Castle which is situated on the highest point of the mountain that bears the same name. You will be able to see the city's main attractions in the distance as well as enjoying wonderful views of the port. In the same area, you can also visit the Joan Mirò Foundation, the Museum of Catalonian History and the Magic Fountain. It is advisable to get up to the first station of the Cable Car by taking the metro to Paral•lel. 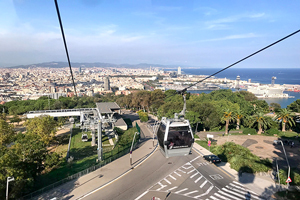 The Montjuïc Cable Car is the most comfortable and panoramic means via which to reach Montjuïc mountain. By choosing this route, you will avoid the long, steep climb and will be able to travel in comfort as you sit and admire the unique spectacle of Barcelona from on high. With tickets that are purchased on-line, you can take advantage of the "Skip the Queue" feature for access to the Cable Car by simply showing your tickets on your smartphone. There are three stops: Parc de Montjuïc, Miramar and Castell de Montjuïc. You can decide to have a break and get off at each stop before eventually reaching the summit where you will find Montjuïc Castle. When you do arrive at the final stop, you will be able to visit the inside of this spectacular castle, (entry is included in the ticket price) and relax and admire the stunning views of the city and its famous attractions. Our advice is to go up from the first station on the Montjuïc Cable Car. In order to get there, you can take the Metro (L2 or L3) towards Paral•lel, or you can also get a number 55 or number 150 bus. If you are wondering how to make your visit to this particular area even more special, we can recommend: in addition to visiting the famous Montjuïc Castle, there is the Joan Mirò Foundation, The Museum of Catalonian History, the Poble Espanyol (a miniature Spanish village) and you can round off your tour with the spectacular night show at Montjuïc's famous Magic Fountain. Insert the type of tickets you require and the number required. On the day of your visit, simply show your tickets on your smartphone at the entry to the Cable Car. The journey out and back.